Will the Polish parliament de-criminalize blaming Poland for Holocaust crimes? 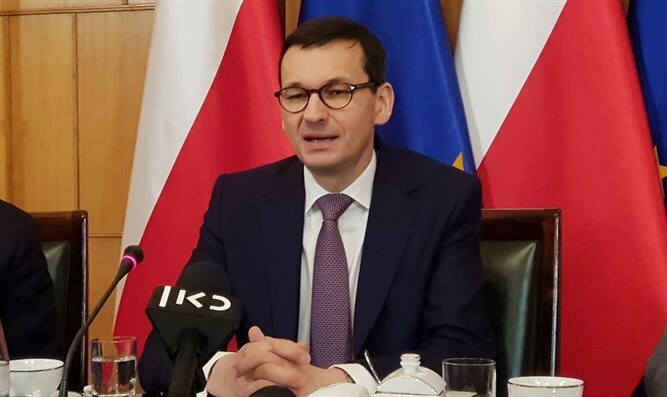 In a move that observers said could defuse tensions between Israel and Poland, that country’s prime minister said he’d kick back to parliament a bill about rhetoric on the Holocaust for amendments. Polish PM Mateusz Morawiecki made the statement Wednesday about a law passed in January, which criminalizes blaming the Polish nation or people for crimes committed by Germany during World War II. “We are moving away from criminal laws that may divert attention from the initial objectives of the original law,” the news site Onet quoted Michał Dworczyk, a top official from Mateusz Morawiecki, as saying. The passing of the law prompted sharp protests from Israel, as well as criticism by the United States, among other countries. Jewish organizations, including the World Jewish Congress, complained the law was a violation of free speech and impediment to historical research of the Holocaust. In Poland, thousands of Jews were saved by locals from the Nazis during their occupation of the country from 1939 to 1945. In addition to killing three million Jewish Poles, the Nazis murdered also three million non-Jewish ones. Many Poles are therefore angry when their ancestors are accused of Nazi crimes. But Poles betrayed to the Nazis thousands of Jews and in some cases, killed Jews themselves. Rafal Pankowski, a spokesperson for the Never Again foundation which monitors anti-Semitism in Poland said his group “welcomes” the move. It is a pity it comes so late, since January the controversy resulted in a terrible wave of antisemitism in Polish media and politics,” he added.